Chelsea grew up in Knoxville, IA. 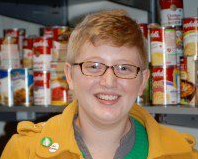 After graduating from Northwestern College in Orange City, IA with a degree in Music Ministry, a calling toward social justice led her to spend the next three years as a full-time volunteer working with people experiencing homelessness and adults with intellectual disabilities through Mission Year and the Episcopal Service Corps in Atlanta, GA. She returned to the Midwest to attend United and graduated with a Master of Arts in Social Transformation degree in December 2016. She lives with her spouse and two adorable cats in Roseville.